Welcome to our blog where we share our love of adventure, family, and vintage with you all. Take a look around and enjoy! 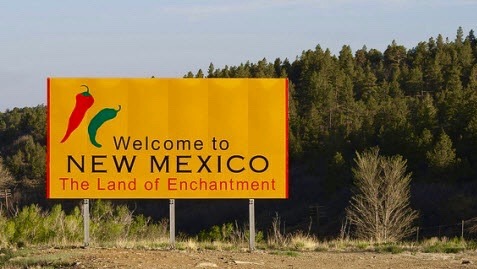 When we crossed the New Mexico border after traveling for so many months, our eyes were wide open, taking in the beauty of the state with its majestic mountains, serene desert landscape, and larger-than-life sky. We knew as we traveled north through the state into Santa Fe that new adventures awaited us. We were all excited with anticipation of what we would experience in the days and weeks ahead. Little did we know that Santa Fe with its genuinely friendly people, refreshingly laid-back culture, and artistic flair would grab hold of our hearts. Days turned into weeks, weeks turned into months, and months have turned into almost 2 years. One aspect of Santa Fe that no one can miss is its art and its people's drive to create. This is concentrated in Santa Fe but is by no means isolated to the city alone. New Mexico as a whole embraces the arts, and the arts is an important part of our state's economy. We had no idea that the film industry played such a large role in the state's success. In fact millions of dollars are pumped into our state's economy every year, thanks to the film industry. In the vintage clothing business, it has been a delight to provide wardrobe departments with one-of-a-kind pieces for various projects. Months after settling into our new home a good friend of ours in Albuquerque encouraged us to apply as "background" for a TV show called "Manhattan" set in the 1940's about the Manhattan Project in Los Alamos, NM. Curious, we all applied hoping to be called. Weeks passed with no word until I received a call one day wanting me for a San Francisco police officer. I was thrilled! I rushed out the door for a fitting at the studio. As I walked in the door to wardrobe, I was stunned at the racks and racks and racks of vintage clothing from the 1940's...it was like stepping back in time. When filming day came there was a great mix of emotion: awe, excitement, nervousness, fear, exhilaration. It was fascinating to watch the crew at work, watch the actors morph into their characters, and step into a 1940's San Francisco. I was bit.......by the film bug. Taken on set of Manhattan Season 2 out in the desert not far from Santa Fe. I'm playing a scientist here. Soon after Manhattan, I responded to a call for a Secret Service Agent on Independence Day: Resurgence. I was thrilled to be chosen and was able to "serve and protect my President" throughout the film. Being on a major motion picture was quite an experience. All of the scenes I was part of were filmed at the Albuquerque Studios, an amazing facility catering to all kinds of filming endevours. Christy got in on the fun too, playing a nurse in a couple of scenes while the aliens attacked! "It will be ok Madame President....I got this"
The widely popular show Longmire filmed right here in Santa Fe provided opportunities for our whole family to get into show biz. All of us have had the chance to play in a scene or two on this great show over the last couple of seasons. Some have asked, "What's it like to be 'background' in film"? The days are often long....sometimes up to 16 hours! The food can be amazing and plentiful. The people are colorful. Background work attracts people from all walks of life, so it is always a kick to meet people. The pay is.....well, not much, but the experience is worth it.....plus as I said above, there's food! The sets and locations are sometimes mind-blowing (Independence Day) and fascinating (Manhattan). Get updates on our adventures and beautiful vintage.